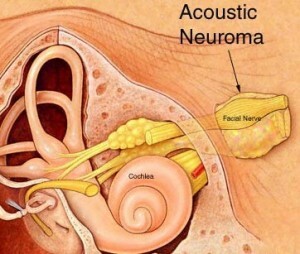 An Acoustic Neuroma is a tumor found in the area of the brain where the auditory (hearing) nerve enters the bony opening of the skull between the brain and the inner ear. The tumor arises in the vestibular nerve, which is involved in balancing the body, and therefore the proper name is a vestibular schwannoma. These tumors are typically benign. 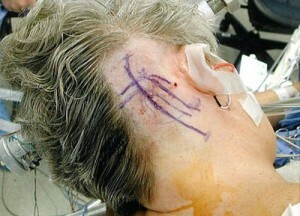 People with Neurofibromatosis Type 2 (NF-2) commonly have acoustic neuromas. Because the treatment of acoustic neuromas is rarely urgent, patients should strongly consider obtaining second opinions prior to undergoing treatment. The chances of a good outcome are increased at larger centers treating a high volume of acoustic neuroma patients. Primary symptoms are one-sided hearing loss, ringing in the ears and problems with balance. Hearing loss progresses slowly in most patients and often is first recognized as difficulty in hearing conversation while on the telephone. The ringing in the ears is high pitched. By the time of diagnosis most patients have these two symptoms. Facial numbness, facial weakness, and taste changes occur as the tumor causes pressure on the fifth and seventh cranial nerves. Large tumors also place pressure on the lower cranial nerves, causing difficulty swallowing and hoarseness. Pure tone audiograms can detect loss of high tones. 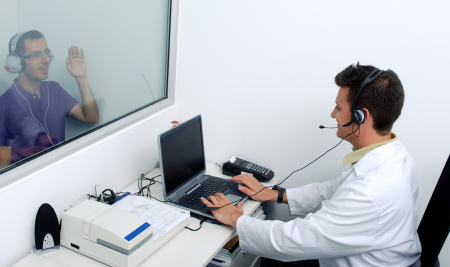 A speech discrimination test can determine hearing function. Special temporal bone computed tomography (CT) scans are necessary to reveal information about the bony areas surrounding the tumor. Tumor size: Large tumors typically require surgical removal. Pressure on the brainstem: Tumors that significantly compress and distort the brain stem may not be good radiation candidates. 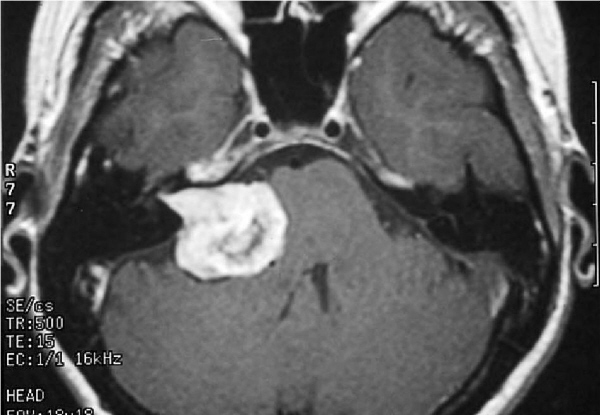 Tumor growth: In many cases, acoustic neuromas are followed on serial MRI scans to see how quickly they grow. If small and stable, no treatment may be necessary. Patient’s age and medical condition: Radiation therapy may be recommended more highly for older and/or medically ill patients. Symptoms: Degree will impact urgency and type of treatment. The tumor may be tackled in various ways. It all depends upon the size and location of tumor, hearing status in addition to other factors. 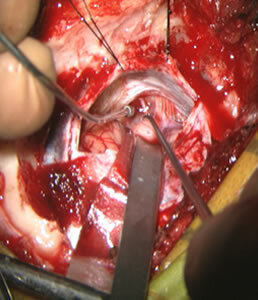 Commonest surgical treatment is retromastoid craniectomy and microsurgical excision. This involves removal of the tumor through the incision behind the ear. We have special expertise in the surgical management of acoustic neuromas. In some cases, radiation is the preferred treatment for newly diagnosed, growing or residual tumor. We offer state-of-the-art radiation delivery techniques that enable high radiation doses to be delivered to the tumor while minimizing radiation exposure to the surrounding brain, skull and skin. Depending on the circumstances, the radiation can be delivered over multiple doses (stereotactic radiotherapy). If trying to preserve hearing (and/or not injure the brainstem), SRT may be a better choice. SRT delivers precise stereotactic radiation divided into multiple smaller doses (fractionation, or also called radiotherapy). Fractionation reduces the risk of radiation damage to the brain stem and cranial nerves. Advantage: Treatment holds greatest chance for a cure if complete removal is possible. Surgery is often the best choice for patients for whom radiation therapy is higher risk or not possible, such as large tumors or very young patients. Disadvantages: Higher risk of hearing loss and facial paralysis compared to SRT. Other possible complications include cerebrospinal fluid leak and meningitis. Advantages: Treatment does not involve surgery and is painless. Compared to SRS, holds lower risk of hearing loss, facial paralysis and radiation necrosis (cell death) of the brain stem. Disadvantages: Treatment may require up to 30 treatments (five days a week for six weeks), and therefore is more practical for patients who live reasonably close to the treatment center. Patients who are claustrophobic may not be candidates. Also, treatment does not remove the mass effect on the brain stem if present, and therefore some symptoms may persist. The best treatment option for any individual is based on multiple factors. Consultation with a neurosurgeon having expertise and access to state-of-the-art facility is highly recommended as these tumors are difficult to reach.